On June 15, 2018, a round-table conference on ‘Let Us Save Children Together’ took place at the Ss Cyril and Methodius Institute of Post-Graduate Studies (CMI) to consider ways of helping children affected by the hostilities and armed conflicts in Syria. 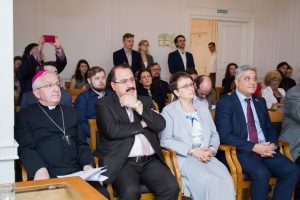 The round table was organized by the Moscow Patriarchate department for external church relations (DECR) with the CMI’s support, the Poznaniye charitable foundation, the Liniya Zhizni charity and the Science-Practice Center for Children’s Psycho-neurology of the Moscow city healthcare department. 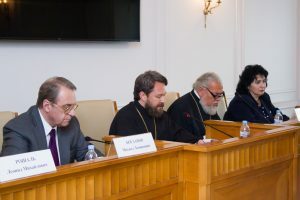 It was attended by Metropolitan Hilarion of Volokolamsk, DECR chairman and CMI rector; M. Bogdanov, deputy minister of the Russian Ministry of Foreign Affairs and presidential special representative for the Middle East and African countries; Ms. Ye. Baibarina, director of the Russian Healthcare Ministry department for medical aid to children and obstetric aid services; Ms. F. Zakharova, president of the Liniya Zhizni charity; Dr. L. Roshal, president of the Emergency Surgery & Children’s Trauma Department of Moscow’s Pediatric Scientific Research Institute; Ms. T. Batysheva, director of the science-practice children’s psycho-neurology center of the Moscow city healthcare department; Mr. Haddad Riad, the Arab Republic of Syria’s ambassador to Russia; Archbishop Celestino Migliore, apostolic nuncio to Russia; Metropolitan Niphon of Philippople, representative of the Patriarch of Antioch to the Patriarch of Moscow and All Russia; Ms. Ye. Agapova, vice-president of the Imperial Orthodox Palestine Society; Mr. Rajhi Al-Ali, president of the Lebanon Club of Russian (Soviet) University Graduates, and others. The work of the roundtable was proceeded by the screening of a reel with shots from Metropolitan Hilarion’s film about the persecution of Christians in the Middle East. ‘In February 2018, with a blessing of His Holiness Patriarch Kirill of Moscow and All Russia, the Moscow Patriarchate department for external church relations came out with an initiative to give aid to children affected by the military actions and armed conflicts in Syria. The aim of the program is to provide the necessary medical and medicinal aid for Syrian children and to ensure their treatment and rehabilitation in Russian hospitals with the highest recovery indicators. Among the principal partners in the program were Poznaniye and Liniya Zhizni charities, as well as the Research and Practice Children’s Psycho-Neurology Center of the Moscow City Healthcare Department. The realization of the program was supported by Patriarch John X of Antioch and All the East. In May 2018, an expert group flew to Lebanon for the medical examination of children from among Syrian refugees, who needed a specialized treatment and consequent rehabilitation in Russia. As a result of the examination, six children with orthopedic injuries were recommended for treatment in Moscow. They will undergo treatment at the Research-Practice Children’s Psycho-Neurology Center or will be placed at other medical facilities in Moscow. It is necessary to make a full examination of the children and prepare them for prosthetic replacement and, if necessary, for other surgical operations. At present, the embassies in Syria and Lebanon are preparing documents for the children to enter Russia with their parents and Russian translations of the accompanying medical documents. Within the next few days the children will arrive in Moscow. It is planned to bring from seven to ten children a month to Moscow for treatment and rehabilitation. The arrival of the next group is planned for the end of July. We welcome any assistance in implementing this important charitable initiative’. Then Metropolitan Hilarion gave the floor to the president of the Liniya Zhizni charity, Ms. F. Zakharova, who explained in detail the role of her foundation in the implementation of the program. The roundtable speakers discussed the project of medical aid to Syrian children (Ms. Batysheva); participation of Russian diplomats in the peacemaking and humanitarian work in Syria (Mr. M. Bogdanov); the present situation in Syria and aid expected by Syrians from the Russian Orthodox Church (Mr. Haddad Riad); support for the project given by the Orthodox Church of Antioch (Metropolitan Niphon); practical experience of organizing medical aid to children (Dr. L. Roshal); organization of the recent humanitarian trip of experts and medical doctors to Lebanon to examine how aid is given to Syrian children from among refugees (Rahji Al-Ali). After the addresses, journalists and guests were given an opportunity for asking questions. In his closing remarks, Metropolitan Hilarion thanked all those present and expressed hope for a successful fulfilment of the task through common efforts.